John Grey, a seemingly minor character encountered by the main protagonists of Diana Gabaldon's Outlander series, becomes a central character on his own in a series of short stories and books. He is a soldier, a gentleman, a noble man (in the original sense of the word), a sodomite, and an altogether human hero - often dragged into the heart of 18th century intrigues during the time surrounding the 7 Years War (French and Indian War to the Americans) in the years between the Scottish Jacobite Rising of 1745 and the American Revolution in 1776. Readers of this series might give the Outlander series a miss, but you will lose out on serveral interactions between John and the Frasers that give a richer view of the character. The Outlander novels are a whopping 40 hours each on average, where LJ reads range between 1 and 14 hours. You should definitely not read the Lord John series out of sequence to itself, which is easy to do accidentally since chronologically it alternates between shortstories and full length novels. Hand of the Devils contains three of the four current short stories, and while they are in order in this collection, make references to events in Private Matter and Brotherhood which leave the reader wanting to know what the heck happened though it does not have an immediate impact on the story. Hellfire (Hand of Devils); Private Matter (novel); Succubus (Hand of Devils); Brotherhood of the Blade(novel); Haunted Soldier (Hand of Devils); Custom of the Army (Warriors, Anthology); Scottish Prisoner (novel not yet released). 170 sur 171 personne(s) ont trouvé cet avis utile. Highly recommended as an appetizing complement to the Outlander series. These three stories fill in a wealth of details about Lord John Greys's life and character. I don't know how interesting I would find them as stand alone works, but they provide backstory for one of my favorite personalities in the Outlander series. Plus they contain lots of clues and context for the longer Lord John books. As usual with Diana Gabaldon there is a wealth of historic detail and some sly humor, with the added twist of the mysteries to be solved. The style of the writing is quite different from that in the Outlander main series - like fine claret as opposed to scotch whiskey, perhaps? Both appeal to me. That being said, the final story 'Hand of Devils' does feel like it could easily be twice as long and better for it; I wanted to know more about some of the characters who remained undeveloped. Still it does tie up some of the loose ends from Brotherhood of the Blade (and will make a lot more sense if you have read that book). I find Jeff Woodman's nuanced reading delightful, he brings the varied cast of characters to life - particularly Grey and his loyal, long suffering valet Tom Byrd. I've listened to these more than once in the past year, and enjoyed picking up on things I missed the first time. You should read all the other Lord John stories before this one or the frequent references will just confuse. Also note that the the first two stories ( Hellfire and the Succubus) are available also on audible so if you are a big Gabaldon fan you will only be getting this book for the third story. 61 sur 65 personne(s) ont trouvé cet avis utile. There are several places throughout the story where the reader has had to repeat a phrase, a Clause, or even as much as a complete paragraph or page. It seems to me that the publisher should enlist the services of a good editor. Here I mean a human being with keen eyes and experience. Apparently neither the programer, who wrote the code for the grammar, syntax and other elements for the proper presentation of a quality work of literature, nor the editor (Was there actually a human editor?) had bothered to examine this piece to ensure the quality of the presentation. The author should sit down with the publisher and demand a re-recording after a scouring of this piece to correct all aforementioned errors. I would recommend it because it is a reliably interesting Diana Gabaldon book, which means that the story pulls you in, the historical setting is so well-drawn you feel you are there, and the reader gains insight into what was happening to one of the lesser characters (Lord John) in the Outlander series between his appearances in the "Big Books." Lord John is voiced so very well by Jeff Woodman that his voice is the one I will hear in my head when I read other Lord John episodes in the Outlander series as well as the Lord John novels and novellas. If you could take any character from Lord John and the Hand of the Devils out to dinner, who would it be and why? Of course it would have to be Lord John. These are his stories, and he has led a very interesting and adventurous life. 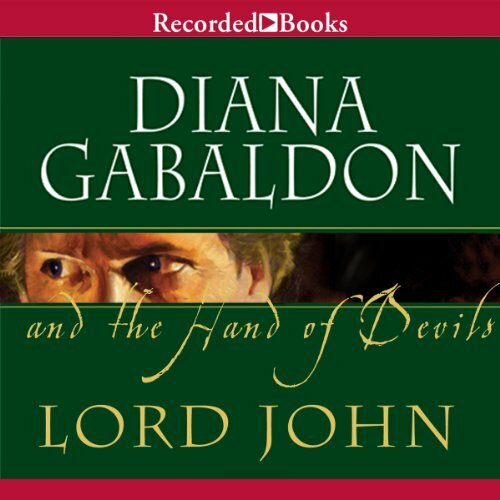 If you like Diana Gabaldon's books, you will like the Lord John stories. Just don't expect this book to be about the Fraser's. It is not. While I had read that some people did not care for the narrator on these books, I like him a lot! I like learning more about Lord John's earlier years, and find him to be a very well rounded and real character. Enjoyed the book very much! Love the various voices he uses in developing the personality of the characters - it isn't the same as when I read them. The narrator is a wonder! Loved the way he brought the characters to life. The short stories were a lot of fun and a great look into this side character from the main Outlander series. This book is great, the narrator, however, has not been fully edited and occasionally repeats himself when testing out different ways to say something. I have to put this read away. Maybe I'll continue it at a later date. Wow, my own fault for not listening to others' reviews. I couldn't believe that two book series could feel so different. I love the Outlander series and wanted to read more into the characters...even a spin off. However, I feel like I went from a big screen movie (Outlander) to a 'B' rated movie (Lord John). I don't know if it is the writing or the narrator's voice, but the feel and quality of the story is way off. And the mention of Jamie Frazer seems forced. John doesn't seem to have the same force of character, which seems strange coming from the same author. So, maybe it all has to do with the narrator. Sorry, save your credits. Another good story from Diana Gabaldon. I always enjoy her stories and especially the Lord John character.